Beoplay M3 is B&O Play's most affordable wi-fi multiroom speaker | What Hi-Fi? At £280, the Beoplay M3 is the most affordable model in B&O’s wireless multi-room speaker range, sitting below the brand's M5, A6 and A9 wireless speakers. Wireless speakers come in all shapes and sizes, but perhaps none more so than B&O’s, which range from the boomerang-like A6 to the Beosound 1, which resembles a tea-flask. The Beoplay M3 – the latest and most affordable model in B&O’s wireless multi-room speaker range – has more modest design ambitions, but is no less attractive than we’ve come to expect from the Scandinavian brand. Available in either a wool blend fabric (created by Danish textile company Kvadrat) or a pearl-blasted anodised aluminium finish, the removable front cover hides a 20mm tweeter and 9cm long stroke mid/woofer. There is also a three-position switch which adjusts EQ according to where you position the M3 in your room. You can play music via Bluetooth, Google Chromecast, Apple AirPlay or a 3.5mm input. According to B&O, the Beoplay M3 will also support Apple AirPlay 2 next year. 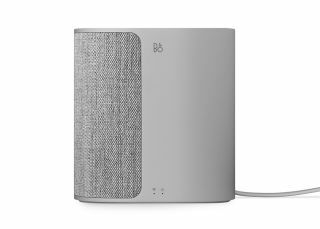 A wi-fi connection allows a multi-room set-up with other B&O speakers in your home. The Beoplay M3 will initially come in natural (light grey) and black finishes, with 'seasonal colours' to follow. The M3 is available now, priced £280.